Find out how modern marketers have implemented content marketing strategies to re-empower their marketing and sales organizations, impact purchase decisions, build trust, and generate quality leads. An examination of the new buyer’s journey and marketing’s new role. 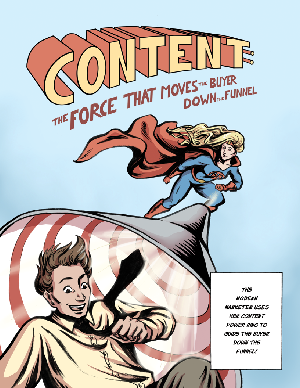 A content marketing comic book (yes, a comic book). A side by side comparison of old-school vs. content-powered marketing. Recommended next steps from content marketing superheroes such as Joe Pulizzi (Content Marketing Institute), Joe Chernov (Kinvey), Barabara Saxby (Accelent Consulting), Todd Wheatland (Kelly OCG), and more!